On Thursday this week, Lupita came to visit. She is age 10, soon to be eleven next month. We were looking through photographs on my computer and found one when she was a toddler playing in a pile of wool. She might want this photo for her quinceañera. 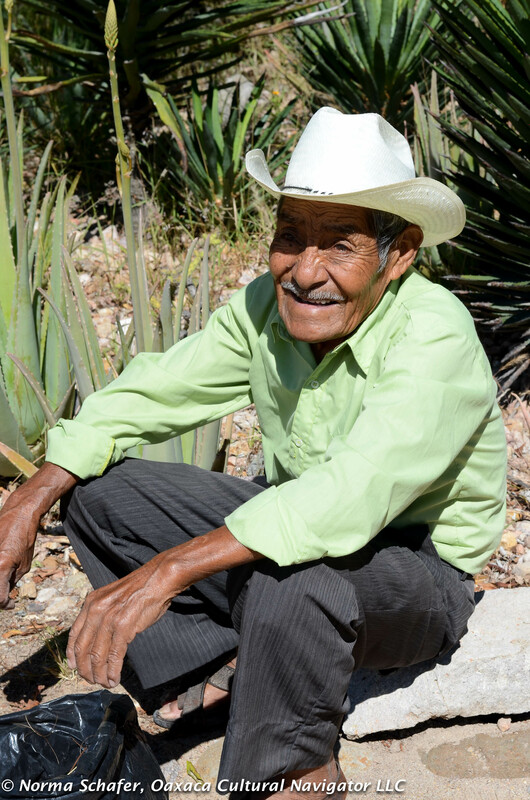 That got us to talking about being young and Zapotec. 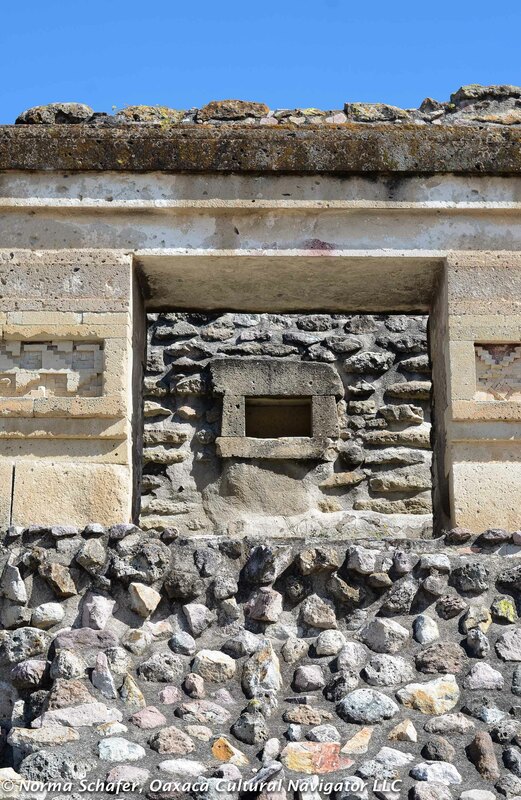 As we scrolled through photos, I stopped on a photo of the San Pablo Villa de Mitla archeological site. What’s that? Lupita said. 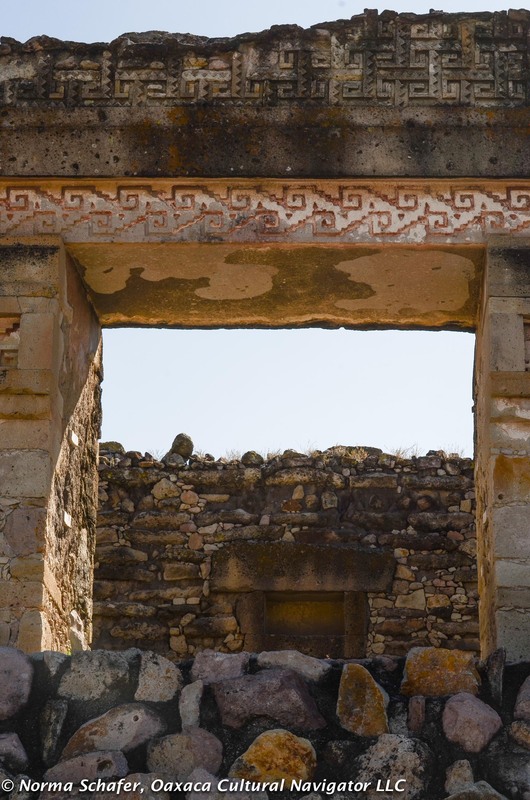 You haven’t been to Mitla? I asked. Do you want to go tomorrow? 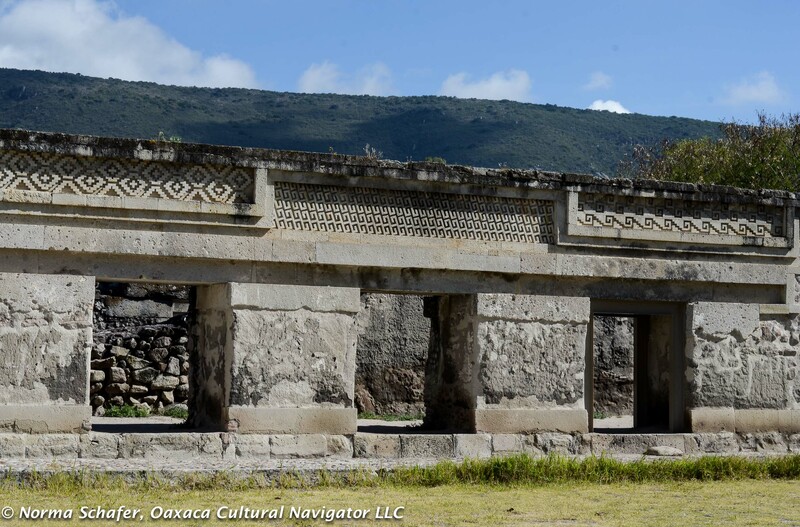 When we got to Mitla early Friday morning, the place was empty. 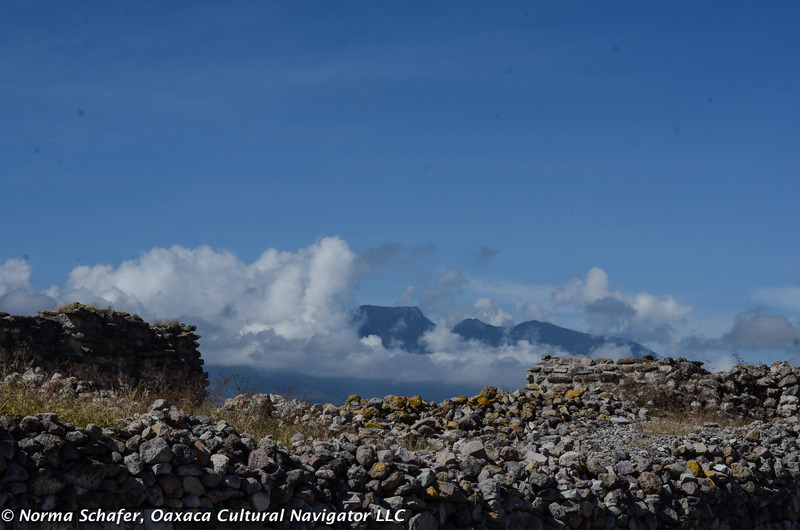 I explained how important this post-classical site is and how special it is to be Zapotec with a proud and ancient history. 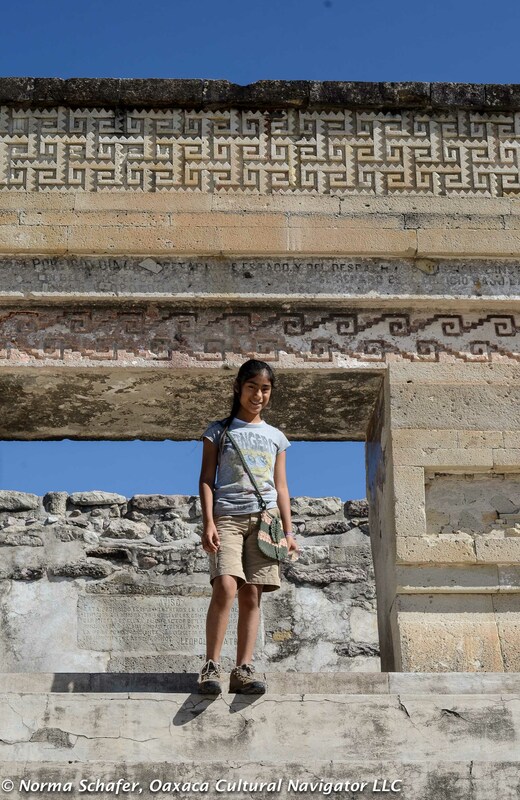 Here and at Monte Alban, the Zapotecs commanded a great nation. There are so many more ancient rocks yet to uncover. 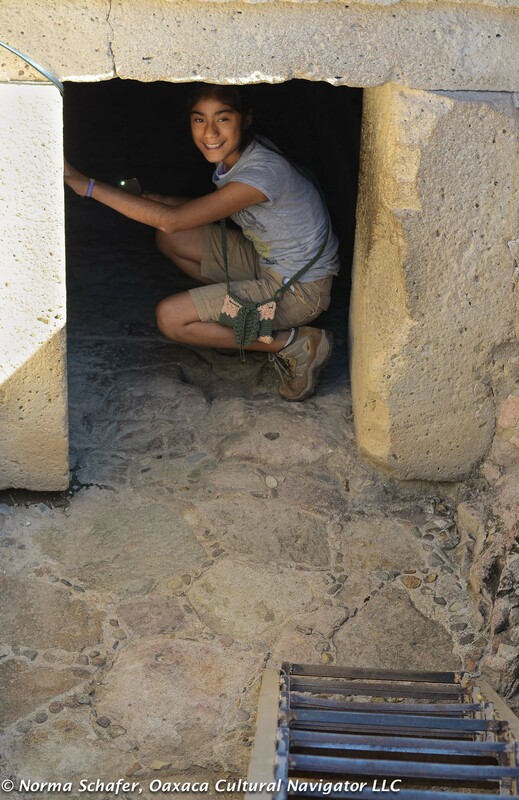 Lupita climbed up the temple steps and then down into the tombs. We talked about how the ancient burial ritual was to move the bones of the those buried before aside to make way for those who had just died. They would be buried in the same tomb. 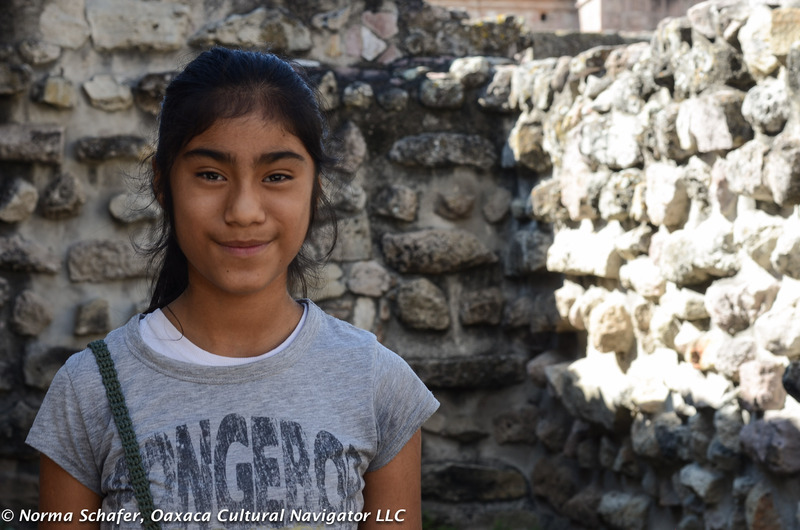 We compared how this ancient Zapotec practice is exactly the way it is today in her village of Teotitlan del Valle. Next week we will go to the cemeteries to celebrate the dead and their return to visit loved ones. Dia de los Muertos is about the continuity of life and it occurs to me that there is no greater tribute than burial in the same resting place as a beloved ancestor. We talked about the history of the Spanish conquest, conversion, how the conquerors took the ancient rocks from the temples and used them to build church walls to attract the people to the new religion. 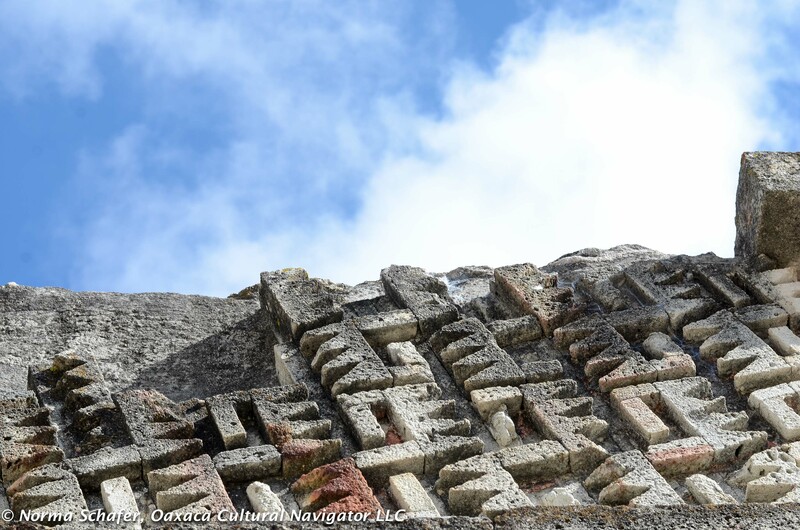 I showed Lupita the example of the wall integrated into the Mitla church structure and pointed to the carved patterns that most Teotitlan del Valle weavers have incorporated into their rug designs. 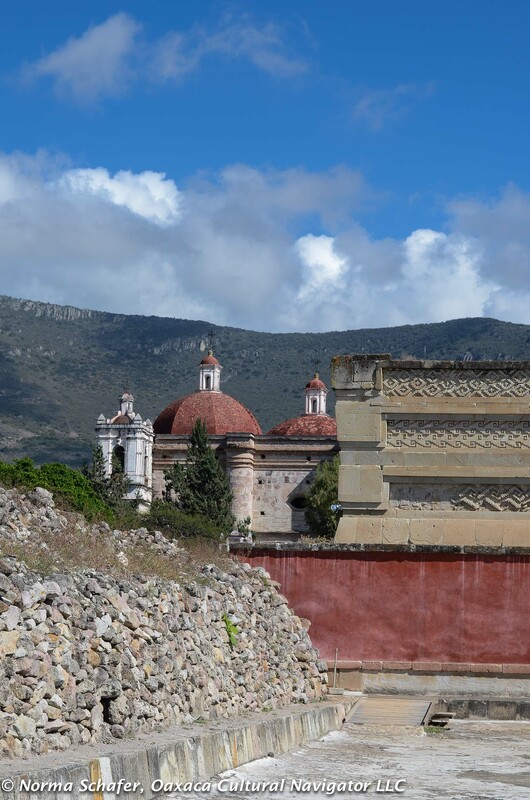 There’s a lot of activity in Mitla now, fresh paint, new hotels and restaurants, since the town just became a Pueblo Magico. We finished up our day together with lunch in Tlacolula at Comedor Mary. Then, I got Lupita to school in time for the start of her 1:30 p.m. classes. With the day only half-finished, I got into my creative side, making flower pins from wool I had felted last year. After “cooking” the finished flowers in hot water with a bit of vinegar, I took them up to the terrace to hang on the line to dry. Oops, why not take a photo? It was such a gorgeous day. When, I returned to the terrace with my camera, this is what I saw. A magic end to a magical day. 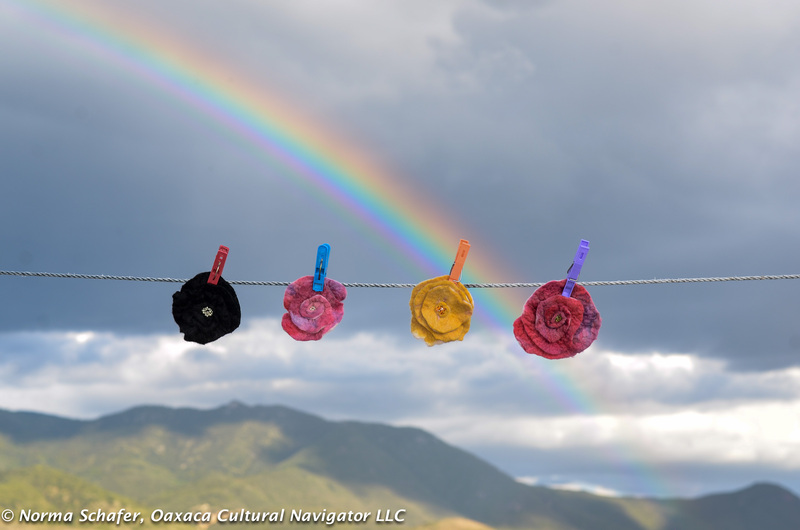 This entry was posted in Cultural Commentary, Oaxaca Mexico art and culture, Photography, Travel & Tourism and tagged archeology, culture, felt flowers, frets, Grecas, Mexico, Oaxaca, rainbows, San Pablo Villa de Mitla, Zapotec. Bookmark the permalink. I really liked reading about your and Lupita’s trip and wondered what the reason was as to why she, and assuming also her family, had not done it before? Is it down to transport, economics, awareness? So many of us marvel in the beauty and historical significance of archeological sites such as these. It would resonate much more so for Lupita and her community. I think that creating opportunities for people to see the archeology, particularly those that it relates to the most, is a really good idea. Good questions, Sophia. I asked Lupita’s mom about why she hadn’t taken her to Mitla. Her reply was, I don’t have a car. I said It’s easy to get there by bus or collectivo. She said, Oh, and shrugged, and then said I never thought of it. So, the answer is All of the above. I think it’s hard to imagine how to negotiate life beyond the village for many and exploring is not part of what some are familiar with. Even elsewhere curiosity is not a trait common in the population, Verdad? So everyday work life and routine tends to dominate. I don’t k ow if “enrichment” for our children is part of the conscious collective here, or anywhere, for most whosoever daily life is a pattern of securing food and clean water. Maslow’s Hierarchy of Needs. I think it is wonderful that you have taken this young girl to see what is around her. 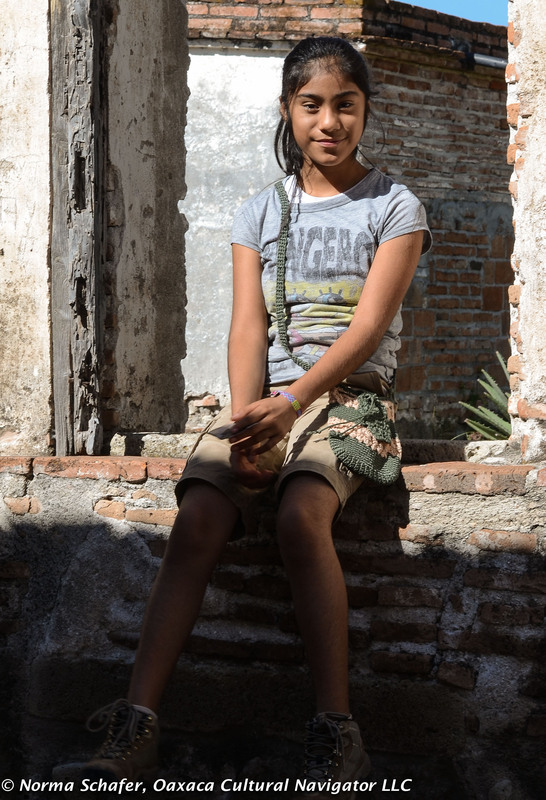 I wonder how many other young people in Teotitlan de Valle have not been “abroad” . My grandson is only 5 now, but in a few years I might welcome a study tour. What a wonderful story. It certainly can change her life. It brought back a long forgotten memory. As a very young, new, teacher in a tough getto school in Albany New York I took my 37 second graders for a walk to the local fire station, one block from the school. None of them had ever seen it. Imagine their excitement and delight being with the firemen on the fire engine. We don’t need to venture far to have amazing experiences. True, enough, Jo Ann. And, staying open to what children need to develop their curiosity is important for each of us to remember. Thanks for sharing this memory. I know you and Tom are always focused out! A beautiful post Norma. You are an inspiration. 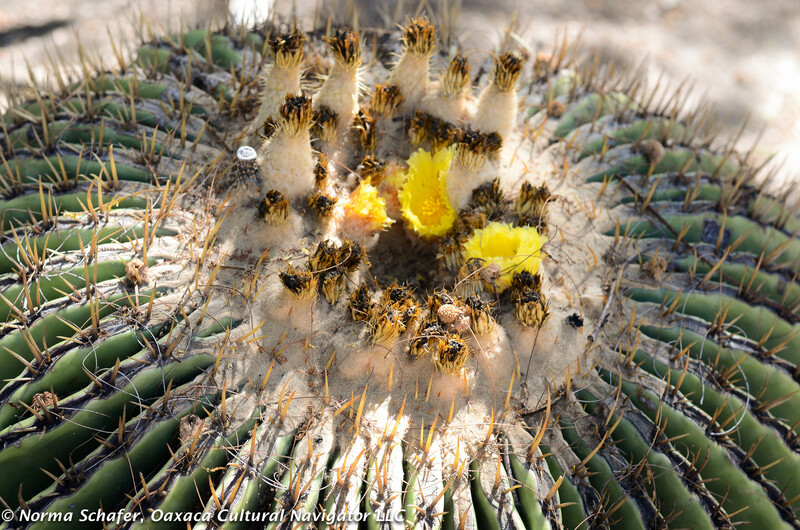 I love receiving your news and I do hope we can catch up in July next as we are spending a few more days in Oaxaca. When people come from as far away as Australia it is a great pity not to see the best (and more) of all that is on offer. For many it is a ‘one off’ trip due to time, distance and cost (our dollar dropped 30%) before my last tour. Happy ‘Day of the Dead’ I wish I were there. Thank you, Carole. I always enjoy your comments. We shall see what July 2016 brings as I have no idea where I will be then! Maybe back in Santa Fe! peeked her curiosity. WOW – you really are bi-lingual. Thanks for showing us your flowers and the rainbow behind. Susanne, I so very much appreciate your comments. I’m far from bilingual but I can get along. For exampleyesterday I needed the word for aluminum foil and came up with Papel de aluminio. Theye knew what i meant! Lillian, also 10, would ADORE a tour like that. She is simply fascinated by history, other cultures and traditions. This also is a lesson for all of us- not to take for granted the history and stories in our own backyards. So often we likely think, since it’s so close, we can see it any time but then never take the time. What a lucky girl to have you as her guide and friend! So true Sara, to pay attention, to appreciate that which could become life’s wallpaper. A great lesson to explore locally. I loved that Lupita took my hand and we walked together throughI these ancient rocks. 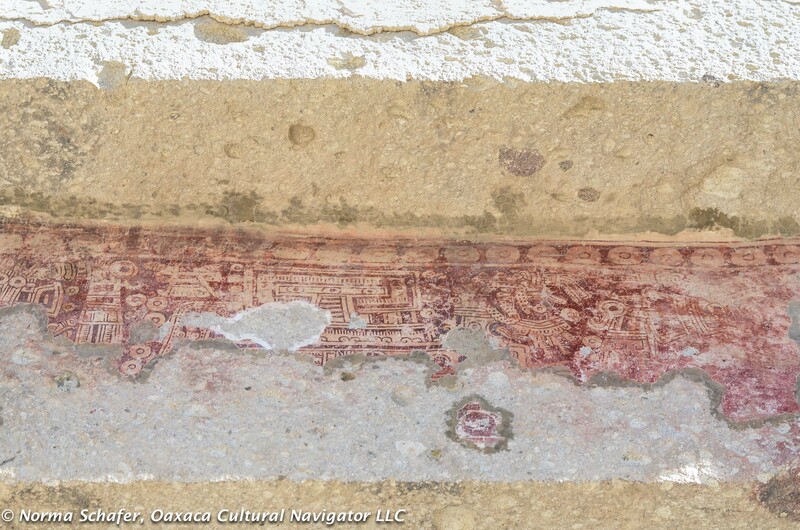 Your comment makes me wonder if there is a study tour opportunity here for parents and children/grandchildren to explore the archeology in the Oaxaca valley. Maybe do some alebrije painting and natural dyes. What do you think?